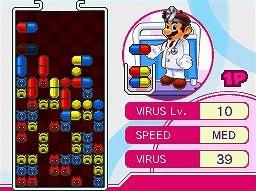 DSiWare edition of the virus-busting puzzle game. Colored pills made up of two segments drop from the top of the jar. Line the segments up with the colored viruses to match four in a row and clear them. Beware, as clearing a line may cause pills to drop down. You can either try to clear jars in Classic Mode, or race to clear your jar against the computer in VS. COM mode.